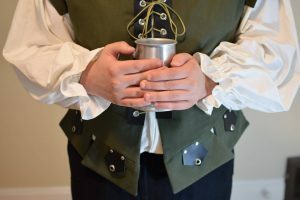 I have been designing some fun Renaissance costumes with leather trim for Halloween, it’s easy to complete this project with your Cricut! These projects are really fun to sew. 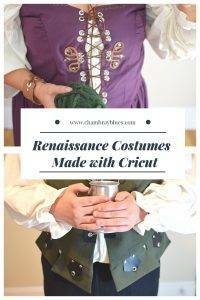 We love Renaissance costumes and my son and I have always wanted to have a matching set! 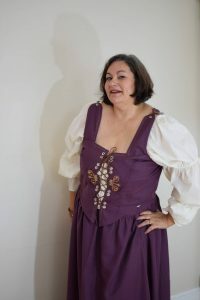 I made these frocks with a little help from my Cricut Maker. 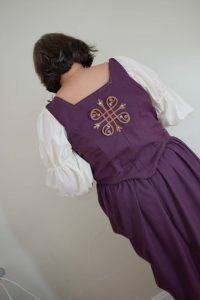 The costumes are made from the Simplicity Patterns line of historical costumes. The sewing isn’t enormously difficult, but the details do take a bit of time to execute. Read on! The Cricut Maker can cut all kinds of things, but I am excited to try cutting leather with it. Using Geniune Leather calls for a different blade a few special modifications to the cutting machine. This video shows the basics of what to do. 1. 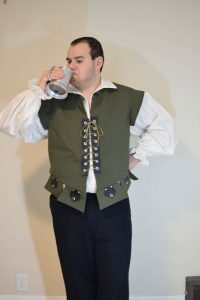 Sew the jerkin according to Simplicity #s4059 pattern directions. 2. Cut the black leather as directed on your Cricut. Here is the design file to download. 3. Attach grommets to center point of the hexagon shape pieces using the premade holes using a rubber mallot. 4. Attach leather hexagons to hem of the jerkin with rivets. Poke a hole thru the leather and fabric with a large nail, then insert the rivet. Secure by pounding with rubber mallot on a hard surface. 5. Mark placement of holes on center front for lacings with the leather placket. 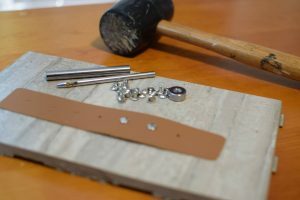 Cut holes with a scissors, insert grommets and attach thru the leather with a rubber mallet. 1. Cut the leather as specified on the Cricut website using this design file, and this one for the wristlet. 2. Clean up any messy leather cuts with a sharp knife. 3. Baste leather in place with spray adhesive. Check fit and placement of appliqué before proceeding. 4. Mark placement of grommets and rivets with chalk. 5. Cut small holes for grommets with a sharp scissors, place leather appliqué in place, then hammer in grommets with rubber mallet. Use a hard surface to hammer on such as a cement floor or hard tile for best results. 6. Repeat above steps for rivets, marking placement with chalk. Use a leather punch to make holes in appliqué and fabric where needed (comes with the rivet kit). Install the rivets and hammer in place with the mallet. 7. Place leather appliqué over center back seam. Mark placement, spray appliqué with adhesive and attach. Make holes with leather punch at critical parts of the design to hold it in place. Install rivets into holes, hammer in place. For the wristlet, cut the leather according to the design space directions. Mark placement of rivets ( I used every 1”), then attach. Cut holes for grommets closure, attach grommets and tie closed with faux lacing. 1. Use a strong grip mat with leather face down. Tape the edges of with masking tape to be sure it won’t the leather to the mat to avoid shift when cutting. 2. Use the deep cut blade. 3. Select genuine leather when choosing material type. 4. 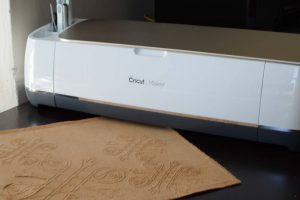 The Cricut Maker will ask if you are finished cutting, check your cuts, if it’s not cut completely cut you can cut it again. There were a couple parts that I had to cut trim with a knife afterwards because it didn’t cut all the way thru the material. 5. Use grommets with “teeth” for the best adhesion. I bought some generic ones that didn’t work at all because they couldn’t grip the fabric and leather. Stick with the name brand to save some frustration. 6. The Maker can cut the small rivet holes too. I realized this too late and used a nail to make them, but the Cricut would do a better job of it. I will update the design so you can have it done right. 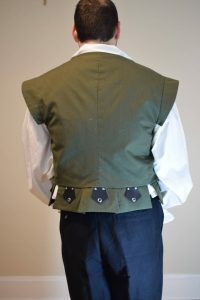 Since the sewing construction details of this project are rather involved, I will cover that in a separate post. Keep an eye out for that post which will be coming soon! 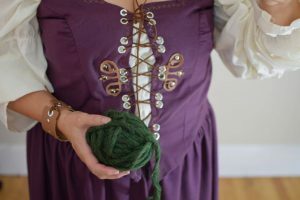 This has been a fun project, we are ready for Halloween or the Renaissance Fair! Our son Ted has always wanted a costume like this, he is very excited to wear it! This post is sponsored by Cricut, any opinions given are completely my own. This post contains affiliate links for your convenience . By making a purchase I will receive a small commission at no additional charge to you. Thank you for your support!